When he died in 1971, the great Burmese meditation master Sayagyi U Ba Khin left an invaluable legacy. He was one of the first teachers in this century to present the ancient technique of Vipassana in a modern, systematic way, making it accessible to people of diverse denominations and cultures. 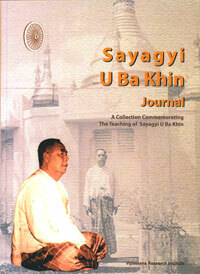 This journal commemorates U Ba Khin's exemplary life and teaching. It contains a selection of his discourses, and biographical sketches of his life and the lives of the teachers who preceded him. Included are essays about his noteworthy career by his renowned disciple, S.N. Goenka, as well as articles on different aspects of the Vipassana technique. Also included are a sampling of Pali research papers from the Vipassana Research Institute; descriptions of the Vipassana meditation centers under Goenkaji's direction; and essays and testimonials by assistant teachers and students of Vipassana. With full color pictures of Sayagyi U Ba Khin, S.N. Goenka, and Vipassana centers. This book is very inspiring, as we can learn about saintly person's way of applying Dhamma in life. It helps believe this path is accessible to everyone who gives right efforts. This book is inspiring and gives a small idea of the recent history of Vipassana. Also a very nice glossary of pali terms often heard during Vipassana courses. As I grow in Dhamma, I feel intimately connected to those who devoted their lives to spreading the technique of Vipassana Meditation in its pure form. Reading the details of Ledi Sayadaw's, Saya Thegyi's, U Ba Kin's, Webu Sayadaw's, and Goenkaji's personal experiences, this companion to any meditator paints a delicate and distinguished portrait of this truly compassionate tradition. This book is personal and nurturing. I would recommend it to each Vipassana meditator.